The gathered crowd at Baltimore Woods. 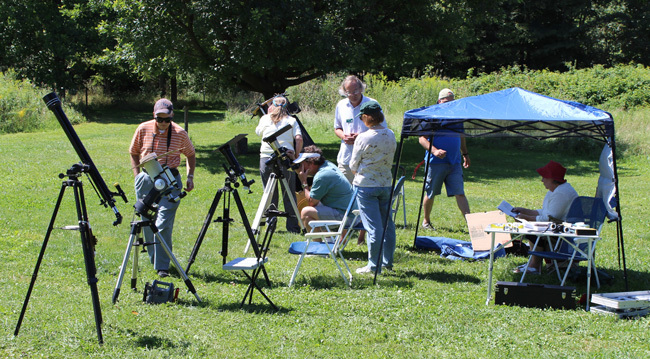 As CNY completes a remarkable span of bright days and clear nights around this year’s Harvest Moon, we finally catch up on our observing logs with a recap of Baltimore Wood’s Solar Session held on an equally bright and clear August 24th. Despite its importance as the primary reason we and this Solar System are here at all, the Sun often gets neglected by some amateur astronomers who opt out of expensive solar equipment in favor of expensive deep sky equipment. The Sun, like all stars, is a seemingly simple ball of light that reveals great complexity depending on what you use to observe it. Some filters knock down all but 0.001%(ish) of the Sun’s light to provide great Sunspot detail, while other filters let only very specific wavelengths of light through – these filters then providing insights into the surface structure of the Sun based on the excitation of specific atoms on the Sun’s surface or in its corona. An observer at a Coronado H-alpha scope. Despite its close proximity and constant activity, the Sun is just like any other astronomical object – patience is the key to appreciating the view. At low magnification and over only a few minutes, Sunspots and prominences appear to drift slowly, if at all, in the field of view. Changing to high magnification reveals dynamic views around Sunspots as they undulate or merge with other spots, with changes that are apparent to trained eyes occurring over many seconds. Observers with good memories can return to their scopes over several minutes to see very obvious changes to large prominences. While the differences may be subtle to the eye, they are anything but subtle on the Sun. Keeping in mind that 107 Earths fit across the diameter of the Sun, seeing changes to large prominence over the course of minutes means that plasma on the Sun’s surface is racing at dizzying speeds. The drama only seems slow from our safe distance. 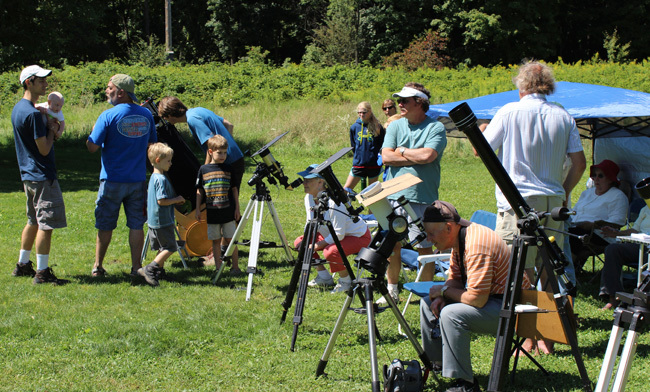 The gathered scopes (and gathering observers). 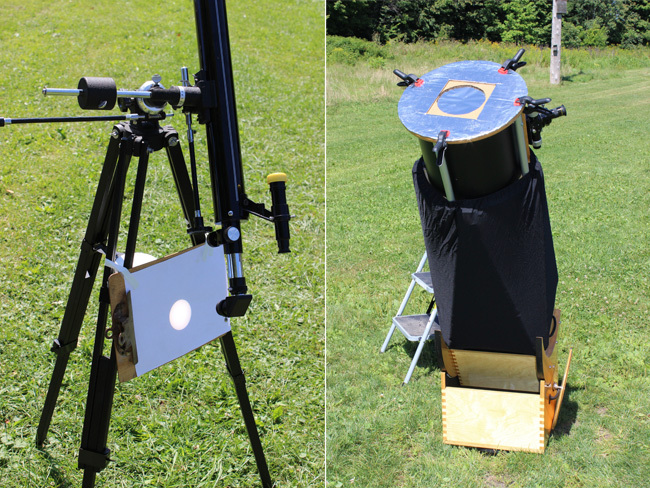 A solar projecting scope (left) and Larry Slosberg’s Baader’ed NMT Dob. Baader Filter – The Baader (“Bah-der”) filter works by reflecting 99.999% of all of the incoming light (almost a mirror), leaving you with a pale yellow disk. You’ll see no prominences or fine surface detail, but Baader filters are excellent for observing sunspots. CaK (Calcium K-line) – The CaK filter lets through a wavelength corresponding to the 393.4 nm Ca K-line transition (you see it as violet). These filters provide excellent surface detail. H-alpha (Hydrogen-alpha) – This filter lets through a hydrogen electronic transition corresponding to a wavelength of 656.28 nm (you see it as a rich red). H-alpha filters are excellent for prominences and good for surface detail. 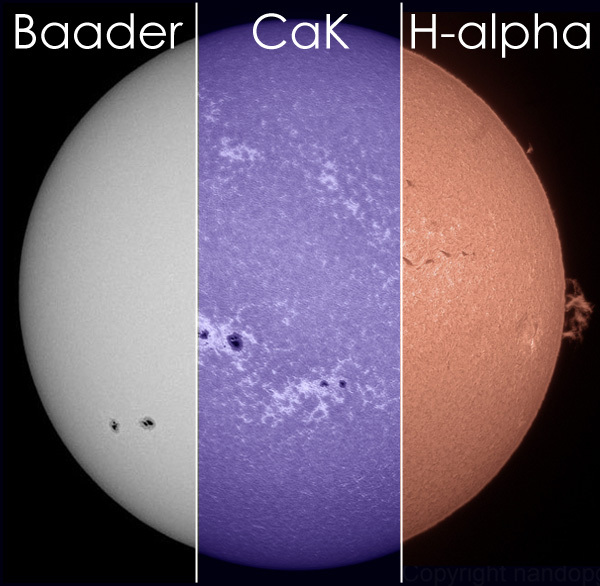 The Sun through different filters (see above). Thanks to the SOHO (Solar And Heliospheric Observatory) satellite and its website, it is easy to find the Sun’s snapshot on August 24th to see exactly what we were looking at, complete with a week’s worth of images from the days before to see how the positions of Sunspots changed as the Sun’s plasma rotated about its axis (the final image in yellow is the view from the 24th). The week before the solar session (images from NASA/SOHO). 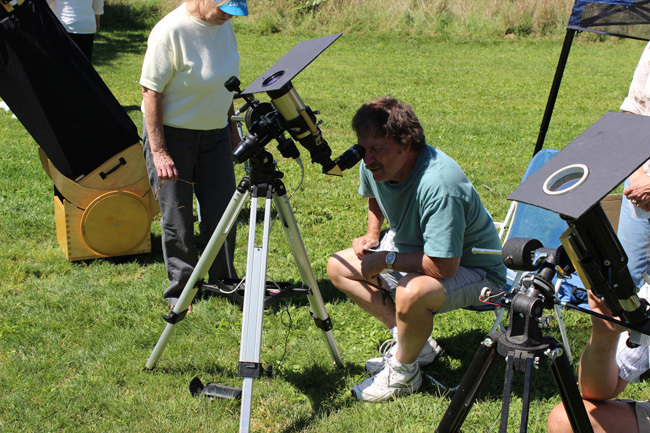 Technical details aside, the session was an excellent one, with approximately 30 people enjoying many views of the Sun and all the solar details Bob, Larry, and I could remember. Of specific note was a prominence that started small at the beginning of the session but grew to contain a clear, dark hole more than one Earth diameter wide over only an hour’s time. The fun wasn’t restricted to scope observers, either. With filtered binoculars and simple Baader glasses, the dimmed ball of light itself was just as interesting a target. 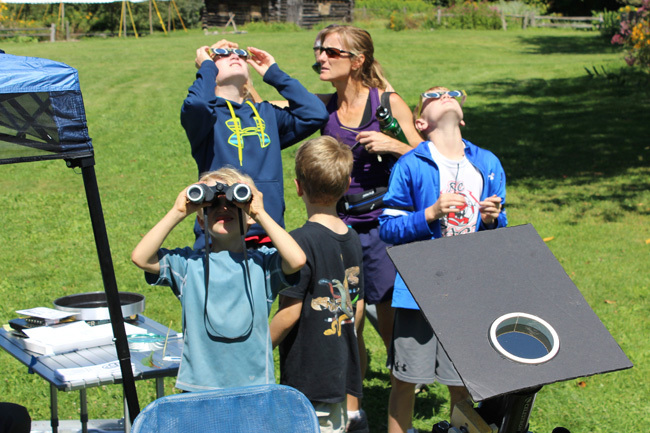 The unmagnified (and nearly unmagnified) view of the Sun through Baader glasses. While I didn’t hear it mentioned, it is worth noting that the unmagnified (but filtered) Sun appears to be about the same diameter as the unmagnified (and unfiltered) Moon – a point of no small significance during Solar Eclipses. And as the Moon is slipping away from us at a rate of 1.5 inches per year, the Solar Eclipse is also (very, very slowly) becoming a thing of the past in favor of what will become Lunar Transits. All the more reason why it’s a great time to be observing! I leave you with the most informative 30 seconds on the website (so far). To demonstrate the dangers of observing the Sun without some kind of filter, Bob and Larry set to work reproducing the fabled ship-burning apparatus of Archimedes (also of Syracuse) by burning one sheet of paper and one dark leaf at low magnification. As Bob explains, this same burning would occur on your retina without something to greatly knock down the Sun’s brightness. I even found myself jumping rather anxiously at one intrepid observer trying to look through the eyepiece of Bob’s projecting scope. Solar safety (and eye safety in general) is no joke! It’s as informative and definitive a video on solar safety as you’ll find on youtube, so feel free to pass the link along to any and all.